Why do people betray each other? It’s the first of many questions that Virtue’s Last Reward forces you to consider, and it’s asked as soon as the title begins. 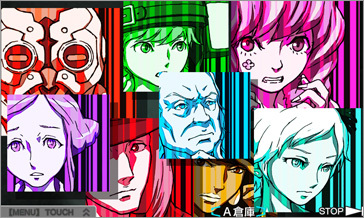 VLR follows closely in the footsteps of its predecessor, 999: Nine Hours, Nine Persons, Nine Doors, in that once again, a group of nine very unfortunate people have been taken hostage and are forced to play a game with frequently deadly results. And just like in 999, each participant is unwillingly branded with a numbered bracelet; a bracelet that can kill them in a moment’s notice should they break the rules. Lead character Sigma awakens in an unfamiliar elevator, with an unknown woman, an incredible headache, and an even worse problem – a computerized rabbit by the name of Zero III has just informed them that the elevator they occupy is about to plummet, which will undoubtedly kill them. Upon their frenzied escape from the elevator, they find themselves in a giant warehouse with seven other strangers; Zero III’s threat was a lie, but that’s just the beginning. Zero III appears once more and informs the group that they have been chosen to participate in the Nonary Game: Ambidex Edition. 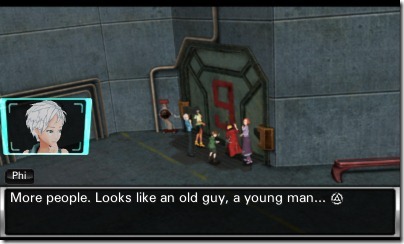 The goal of the game is to obtain 9 points and escape the facility through the number 9 door. Anyone familiar with 999 will immediately be familiar with this formula. 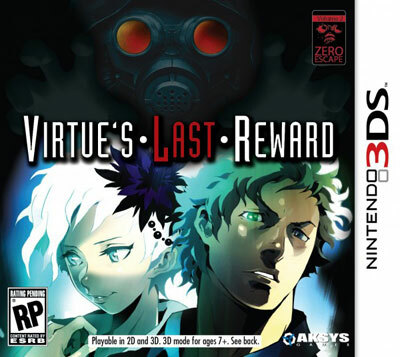 Virtue’s Last Reward is separated into two portions – novel and escape. In the novel portion, you read along with the story and make choices that dictate what path you take through the story. Each character’s bracelet has a different color and the label of “pair” or “solo”. Each colored pair has to partner with a solo to access the different colored doors in the facility. This portion of the game also includes the AB rooms, where the AB Game is played. In this game, each team of pairs and solos are separated and play against each other. Only one question is asked: ally or betray? The answers to these questions directly dictate how many points you receive, which influences your chances of escape. If both teams ally, they both earn two points. If both teams betray, neither team earns points. Here’s the kicker, though – If one team allies and the other betrays, the team that betrays earns 3 points, while the team that allied loses two. If your points reach zero…well, it’s your job to make sure they don’t. After the points are tallied, the colors and pair/solo labels also shuffle. Which is why the question, “Why do people betray each other?” is so important. Can you bring yourself to ally with someone you know nothing about? At what cost do you choose to shatter someone’s trust in you? Even if you don’t think it, the game will eventually lead you to ponder whether or not you have any ethical or moral obligation to the other participants, and all the while, your lives will be on the line. What happens if someone reaches nine points before you? The door only opens one time. There is no limit to how many people can leave the facility, but that door will only open once. Can you trust the others not to abandon you? It’s an interesting game play and narrative device, as well as a fascinating psychological experiment. It’s necessary to work together to access the various rooms of the facility, but you’re also continually on guard. It’s a literal game of tug-of-war. And everyone knows that if they all allied, they’d all gain 2 points each round and eventually gain enough to leave as a group, but aside from the aforementioned trust issues, it isn’t long before other more serious threats make themselves known. Indeed, the participants in this game have more to fear than just each other. The combination of the doors you choose, and who you ally or betray with, dictates which route you take toward one of the game’s 24 endings. A handy flowchart button on the touch screen keeps track of the choices you’ve made and actively encourages you to explore all the options within the story. Even this functions as a device within the narrative, but that’s best left to be discovered on your own. Other options include fast-forwarding through text you’re already read, a notepad for notes, and an archive of all materials discovered and passwords used. 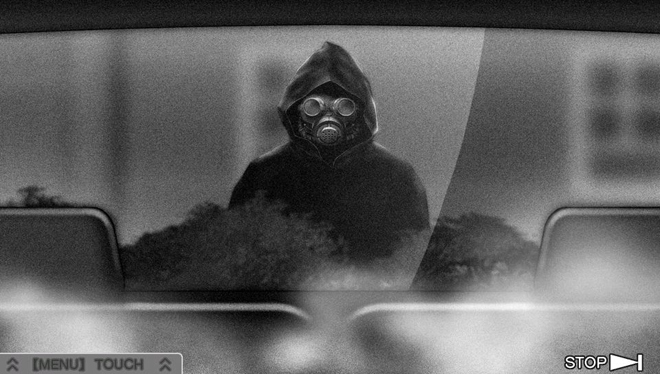 The second portion of the game – escape – is exactly what it sounds like. Behind each colored door is a room with a locked door and the puzzles within must be solved to find the password to open the safe that contains the key. You interact with the environment through the touch screen and solve a multitude of various scientific, mathematical, and logic problems. You’ll grind up plants for DNA samples in the laboratory, play pool and darts with specific rules in the recreation room, and use your brain to sort foodstuffs in the correct order in the pantry. Each riddle is full of countless steps and the puzzles are often incredibly esoteric. Fortunately, when you’re finally stumped, you can switch to easy mode and your teammates will give hints. There is one downside to easy mode – each room actually contains two passwords. One password nets you the exit key, but the other password earns you a file. On hard, you receive a gold file, which contains helpful or humorous bonus information about the characters and their back stories. On easy, you only get a silver file, which contains significantly less information than gold. As a visual novel, Virtue’s Last Reward is entirely dependent on the quality of its story. Aksys has done an admirable job once again in its localization and the writing and story is simply top-notch. Each character is unique and has a specific reason they were chosen to participate in the game, and half the fun is discovering that reason. Every choice, every ending, every action has a purpose in the grand scheme of things. And when it all finally comes together into a cohesive whole in the end…well, simply put, it blew my mind. It’s a complex tale of despair, redemption, and trust, but it’s also mixed with a hefty dose of physics, psychology and faith. It demands your attention, but you have no choice but to give it your all. The discovery of Zero’s identity (the person, not the computerized rabbit), the one who kidnapped and orchestrated the entire scenario, is easily worth the price of admission, but even that realization is just the tip of the iceberg. 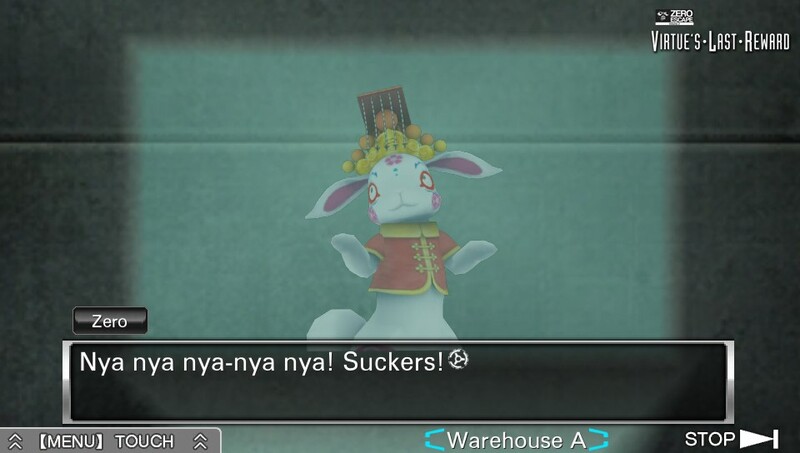 Virtue’s Last Reward includes a surprising amount of high-quality voice acting. Dialogue is spoken clearly and with conviction. Much to my surprise, the character screams were especially accurate. One instance in particular, the cries of one of the younger characters to let him kill himself, sent shivers through my body. There’s also a Japanese voice option if you prefer that over English. While all the characters have solid voice actors behind them, the character that wins the award for best voice acting is Zero III. Zero III is some sort of rabbit amalgam of multiple personalities. He continuously switches between the voices of a sports announcer, a stereotypical valley girl, a college “bro”, a 1950s housewife, a happy-go-lucky Disney character, and finally, something indescribably cold and sinister. These switches can occur between sentences and even within the same sentence. It’s audibly confusing, irritating to hear and yet, completely enthralling. Add to this that he regularly throws in rabbit puns…all the while discussing the grisly deaths you could face around the next bend. Truly, he is demented and repulsive, and yet an appropriate figurehead for the game. The soundtrack is also starkly appropriate for Virtue’s Last Reward’s setting. The laboratory and treatment centers have a more sci-fi vibe, while the garden has a more relaxed tone. Regardless of the room, the music in each evokes a sense of mystery to it. There’s always a lone instrument in the background or a hollow or echoed quality to songs. It’s just as disconcerting as the situations that the room’s occupants find themselves in. The music that plays in Room Q, the final room, illustrates this sci-fi/echo/mystery theme well. Sound effects are what you’d expect, but stabbings are especially gory. Character models and environments are rendered in 3D, unlike 999’s 2D artwork. This initially turned me off because I thoroughly enjoy 2D artwork, but the new design quickly grew on me. It allows the characters to react realistically to pressures and situations. The art style itself is somewhat stylized, as the bodies and clothing of the characters all have a soft, almost slightly cartoonish-quality to them. Combine this style choice with gruesome murders and the situation is made all the more uncomfortable because of it, especially when a scalpel comes into play in one of the endings. The 3D effect in the Nintendo 3DS works perfectly for this genre, especially for me. I typically can’t use the 3D in any game for more than 10 minutes at a time, but because the game plays at a slower pace, I left it on longer than usual. It adds depth to the environment and really makes the characters stand out. It’s a nice touch to the detailed environments and character design. Clover and Luna argue over a…gun. 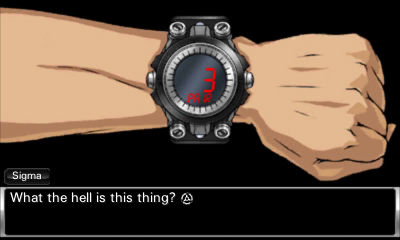 Virtue’s Last Reward is in every way a continuation and evolution of the sturdy groundwork created in 999. Its enthralling tale of trust, betrayal, and consequence simply cannot be missed. If there’s one fault in the game, it’s that it eventually ends and it does so with a cliffhanger. And as with any game in this genre, it’s essentially a book – once you’ve read it, there’s not much reason to come back. However, it’s a lengthy and deep read, and one hell of a ride from start to finish. The review is based on the 3DS version. Review copy was provided by publisher.